A team led by CSIRO Petroleum’s Dr Rob Jeffrey has developed a technology that enables the controlled caving of roof rock in coal mines and block caving in metal mines and preconditioning of ore before mining to enhance its caveability and reduce fragment sizes. These developments increase mining productivity and safety. It has enabled underground metal mines such as Northparkes in NSW to use blockcaving more efficiently, and coal mines such as Moonee in NSW to manage a safety issue which threatened to force closure of the mine. Their mine manager stated that: ‘The new technology (hydraulic fracturing) has been an absolute lifeline for us. The seriousness of the safety issues at Moonee threatened the survival of the $48 million a year operation which may well have resulted in the loss of hundreds of jobs and 2 million tonnes of premium export coal’. The team, which includes the NSW company Strata Control Technologies (SCT), has won international recognition for their work, evidenced by invitations to assist with major international mining companies and research consortia working in Australia and South America. 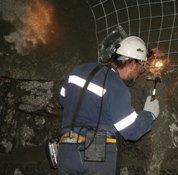 The internationally patented technology has been developed from a fundamental understanding of the stresses operating in mines combined with basic research into the propagation of fractures using designed fluids, numerical modeling of fractured rock masses and, most importantly, a close and effective relationship with key people in the mining industry. Hydraulic fracturing is now used to precondition ore for mining in several mines in Chile and two large mines in Australia. Hydraulic fracturing involves producing and extending fractures in rock by injecting a fluid under pressure into a section of a borehole. The fluid pressure produces tensile stress in the rock at the borehole wall, causing a fracture to start. The fluid then enters the fracture and opens and extends it deep into the rock. Hydraulic fracturing provides a way of growing fractures from a single initiation point and extending them to 50 metres and more from the borehole. Hydraulic fracturing is widely applied in the petroleum industry to stimulate oil and gas production from low permeability, ‘tight’ reservoirs. It is applied to about half of the new oil and gas wells drilled each year to increase their economic value. The application of this technology to the mining industry is, however, not yet well established. When applied to mining and cave inducement, hydraulic fracturing weakens the rock resulting in fragmentation, causing it to cave more readily. Hydraulic fracture can be applied around the mine excavation to induce the rock to cave into the opening provided, or it can be applied to the undisturbed rock or ore well in advance of mining as a method to pre-weaken or pre-condition the rock for eventual caving. The advances in caving technology have been a team effort under the leadership of Dr Robert Jeffrey. The success of the CSIRO Petroleum hydraulic fracturing group was built on 12 years effort in developing equipment, instrumentation, knowledge, and skills in designing, conducting and analysing hydraulic fracture treatments. Early work in hydraulic fracturing at CSIRO Petroleum concerned quantifying fracture growth in coal. Field experiments were conducted near underground coal mines and the treatment data were supplemented with direct observation of the fracture geometry obtained by mining and mapping operations. Later, the experiments were extended to include monitoring boreholes in the design, which provided real-time measurement of the fracture growth. This work provided the basis for developing new understanding of hydraulic fracture mechanics and growth of fractures in naturally fractured formations. One of the strengths of the research has been its breadth involving fracturing in coal, sandstone and ‘hard rock’. All of these are linked to a main research theme aimed at measuring and improving the ability to predict fracture growth at full scale. The final phase of technical demonstration and mining application was expedited by the close involvement of industry collaborators. In 1997, the hydraulic fracturing group at CSIRO Petroleum were approached by Mr Andre van As, a geotechnical engineer, to trial hydraulic fracturing for inducing caving at the Northparkes E26 mine. Treatment methods were developed during this period and the effectiveness of fracturing in inducing caving at the mine was proven. A fracturing equipment system was designed, built, and delivered to the mine, allowing the mine to continue to use hydraulic fracturing to induce caving. From 1997 through 1999, eight million tonnes of copper-gold ore were induced to cave saving the mine several million dollars compared with conventional blasting methods. Since that initial work was carried out, laboratory and field experiments (in Australia and Chile) have been conducted to improve the technology. Numerical modeling has been used extensively in the past few years with a focus on understanding how hydraulic fractures grow through shear zones and natural fractures in their path. Hydraulic fracturing is currently used at two block caving mines in Australia and at several in Chile. Mr van As was involved in all stages of the technology development at Northparkes and his involvement and support were critical to the successful implementation of hydraulic fracturing at that mine and, in large part, to the increasing interest in the technology by the wider metalliferous mining industry. In the coal mining industry, hydraulic fracturing has been used at Moonee Colliery, an underground longwall coal mine in NSW. It was introduced there by the CSIRO Petroleum hydraulic fracturing group and SCT Operations (Dr Ken Mills) in June 1999. Ken Mills first suggested the use of hydraulic fracturing to Moonee Colliery to address their difficult caving problems and contacted CSIRO to obtain expert assistance in testing and developing the process for the mine. His knowledge of coal mine strata mechanics was vital in implementing fracturing at Moonee and developing the technology for that environment. Without the ability to induce the strong conglomerate roof to cave in a controlled manner, the mine was faced with closure. Apart from his team management role, Robert Jeffrey provided the theoretical foundation to the work. A new hydraulic fracture model was developed that accounted for the nearby free surface. This design model is unique and allows fracture growth to be related to injected volume and rate, which is critical to developing designs and analysing and improving the fracture treatments. For example, the new model was used to compare the effect of injecting water, the normal treating fluid used at Moonee, to a viscous crosslinked gel. The crosslinked gel was found to control fluid loss into the surrounding rock and create a higher pressure in the fracture. This model-driven design change was then trialed at Moonee with the result that, for the first time, a caving event was induced during longwall startup. Fracture growth in naturally fractured rock and the interaction of the hydraulic fracture with a nearby free surface are two aspects of the application of fracturing to mining that required detailed theoretical analysis prior to the development of new design methods and models. Highly specialised equipment and instrumentation support was provided within CSIRO by Mr Tim Ferguson and Mr Michael Camilleri. Mr Ferguson, a Senior Technical Officer at CSIRO Petroleum worked as a key member of the hydraulic fracturing team since 1991. He designed and built much of the specialised instrumentation and associated equipment. He was involved operationally with all of the experiments and trials that resulted in development of hydraulic fracturing as a reliable method for inducing caving in mining. Mr Camilleri, a Technical Officer at CSIRO Petroleum, worked in the hydraulic fracturing project before and during the development of the technology as applied to mining. His strong commitment and knowledge in instrument making and fabrication of mechanical systems was critical to the success of the team. He was also involved in the operation of the fracturing system throughout the development of the technology for cave inducement. During the development stage of the technology, a new straddle packer system, a downhole packer inflation valve, and an integrated instrumented pumping system were developed and deployed. The introduction of hydraulic fracturing at Northparkes has been followed closely by the wider metalliferous mining industry. Hydraulic fracturing is now considered as a proven technology for cave inducement and is used in preconditioning ore for caving at four mines in Australia and overseas. As a result, the CSIRO team has an enviable national and international profile. The international impact and profile of Dr Jeffrey’s team is also illustrated by an invitation to join an international caving study being coordinated by the Julius Kruschnitt Mining Research Centre of the University of Queensland. This caving study is sponsored by all of the companies around the world that use underground cave mining methods. In 2000 a collaboration was established with one of the world’s leading rock mechanics groups at the University of Minnesota. Patents covering hydraulic fracturing to induce caving and to precondition ore for caving have been granted to CSIRO in Australia, South Africa, Chile, USA, and a in Canada and the research has been published and presented at conferences, workshops and directly to industry. For this work Robert Jeffrey, Tim Ferguson and Michael Camilleri (CSIRO Petroleum), Andre van As, (Northparkes Mines) and Ken Mills (Strata Control Technology Ltd) were awarded a CSIRO Medal for Research Achievement in 2001. Jeffrey RG, 2010, Personal communication.